Sidebars are typically used on blogs, but it is possible to setup a sidebar on regular Showit pages without the use of Wordpress placeholders. A sidebar will be designed as a site canvas for use across multiple pages and for ease of editing the sidebar. You may start by either adding a canvas to a current page layout and convert to a site canvas later or start by creating a blank site canvas. Adjust Stacking Order - Raise the stacking order number to make sure the sidebar is always stacked over other canvases on the page. 3. 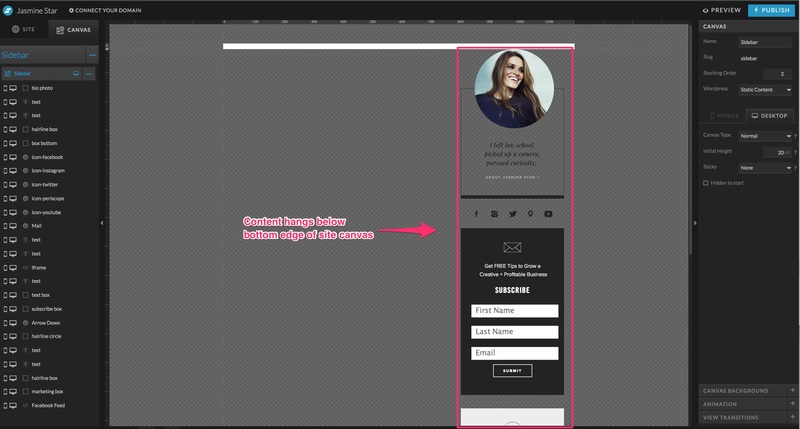 Design your sidebar with the content hanging below the bottom edge of the site canvas. Keep in mind that you need to make sure your design won't overlap other content when it's used on the page. 4. Place your site canvas on your page (or convert to a site canvas if you were designing directly on an active page). It should be placed above any Post Canvas that's set "In Post Loop". The sidebar remains as a "Static Content" canvas above posts. A custom sidebar in Showit can make use of the following placeholders as long as it's being used on a Blog Template page. WordPress also uses the term “Sidebar” to define an area in the theme design that Wordpress Widgets can be placed into. If you use the Sidebar 1, 2 or 3 Placeholders in your design then you can populate those areas with widgets inside of your Wordpress Admin > Appearance > Widgets settings area. Keep in mind that these Wordpress Widgets may vary in size and design output so you may need to see how the content generates with your design and make adjustments to your layout to accommodate.